Missed last week's headlines? Read them here. 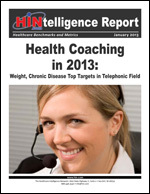 © 2013 Healthcare Data Digest by Healthcare Intelligence Network. Lays the groundwork for a population health management (PHM) program, providing a comprehensive set of 2012 PHM benchmarks from 102 companies and strategic advice from early adopters of a PHM approach. Reserve your print or PDF copy today. "Advanced illness care coordination can't be measured by numbers alone on hospital admissions or length of time in hospice." Watch the webinar today or order a training DVD or CD-ROM.